In September 1996 a Process Action Team (PAT) was formed by the Secretary of Defense in response to Section 4308 of the National Defense Authorization Act for Fiscal Year 1996. The PAT was chartered to take full opportunity of this legislation and to develop solutions for many DoD acquisition workforce personnel issues. The team included managers from each of the Military Services and DoD Components, as well as subject-matter experts from civilian personnel and manpower. This team developed initiatives that, together, represent sweeping changes to the entire spectrum of human resource management for the DoD acquisition workforce. Several initiatives were designed to assist DoD acquisition activities in hiring and placing the best people to fulfill mission requirements. Others focused on developing, motivating, and equitably compensating employees based on their contribution to the mission. Initiatives to maintain organizational excellence were also developed. These initiatives were endorsed and accepted in total by the acquisition leadership. 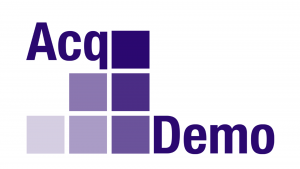 The AcqDemo’s first Federal Register Notice was published on March 24, 1998. The second version was published ten months later on January 8, 1999. Several amendments to this document, which are available below, have occured since January of 1999. On September 30, 1999, the first Contribution-based Compensation and Appraisal System (CCAS) rating cycle was completed with the General Pay Increase, Contribution Rating Increase and Contribution Award effective January 2, 2000. The program is now in its 6th cycle. There are AcqDemo participants from all the Services, OUSD (AT&L), and the Defense Agencies. The DoD Civilian Acquisition Workforce Personnel Demonstration Project (AcqDemo) is a Congressionally-mandated project designed to show that the DoD Acquisition, Technology, and Logistics (AT&L) workforce can be improved by providing employees with a flexible, responsive personnel system that rewards employee contribution and provides line managers with greater authority over personnel actions. Why have a demonstration Project? In the coming years, the population of the DoD AT&L workforce is projected to decline. The AcqDemo is designed to attract, motivate, and retain high-quality acquisition, technology, and logistics professionals. Who is covered by the AcqDemo? Acquisition professionals across DoD AT&L in all Services and Agencies are potentially eligible, as well as supporting personnel assigned to work directly with the AT&L workforce. There are currently over 5,000 total participants in the AcqDemo from the Services and OSD (AT&L). Q: Can an employee receive a salary increase if moving to a position with a higher control point, but within the same broadband level? EX.) A supervisory position will most likely have a higher control point than a non-supervisory position within the same broadband (NH04). Salary increases within a broadband level can only occur within the annual CCAS appraisal process. Operating Guide Reference: Chapter 5.3.1 Compensation Methodologies: AcqDemo includes appointment flexibilities designed to make DoD’s acquisition organizations more agile and improve their ability to compete for talent, especially from the private sector. A key flexibility that distinguishes AcqDemo from General Schedule (GS) is its use of broadbanding, which allows movement through the band without the need for staffing actions. Broadbanding makes available a broader range of assignment flexibilities within a broadband level. However, basic pay adjustments within a broadband level is made only with the AcqDemo CCAS Contribution Rating Increase (CRI). Q: Are there pay setting limitations when a selected candidate is already in AcqDemo? If the candidate is selected for a position that is the same as his/her current broadband level, no salary increase can be offered at the time the candidate accepts the new position. What pay increases can be offered to a candidate who is already in AcqDemo? Salary increases in these instances take place during the pay pool panel process during the review of the candidate’s contributions. If the candidate is selected for a position in a higher broadband level than his/her current broadband level, a 0% – 20% salary increase can be offered. Q: I am new to AcqDemo and need access to CAS2Net? Contact your organizations’ Pay Pool admin and provide your EDIPI to setup a new account in CAS2Net. Q: Under AcqDemo, we used to have the choice of whether to calculate the WGI Buy-in for the date of the last WGI or from the date of the QSI. Is that still an option under the new AcqDemo FRN? The Buy-in is calculated from the effective date of the last within-grade-increase, not the effective date of the QSI. Q: Clarification of section 4.11.3 of the Army Supplement to the DoD guide – is this section intended to be only for AcqDemo to AcqDemo moves? Q: is section 4.11.3 for moves from the pay systems (GS) into AcqDemo that would be deemed a promotion action? This section is on non-competitive movements involving promotions. So, for GS to AcqDemo, you would use 4.11.7.2. If you use 3.11.7.2, you will be limited to the WGI buy-in for this non-competitive movement promotion. Q: Do we need to complete a Post-Cycle Activity for an employee that received a temporary promotion? Since the temporary promotion will end 10 Oct 2018, which is before the January 2019 payout, there is no need to do a Post-Cycle Activity. A Post-Cycle Activity is required only when the temporary promotion is beyond the effective date of the January payout. Q: Will PAQL effect pay? PAQL is only used in case of a RIF and then it is used to determine placement on the master retention list. Q: Will the PAQL be captured in CWB? The CMS that we receive for the FY18 Cycle will contain all the changes from the 2017 Federal Register. Q: Will it be reflected on CCAS rating of record? The PAQL is the rating of record. Q: Can an employee receive a bonus if they were in AcqDemo a portion of the current FY, left for Private industry (or outside of AcqDemo), and came back after 3 July of the same FY? The employee must have entered AcqDemo for at least 90 consecutive days prior to EOY in order to receive the bonus. The employee will still receive the General Pay Increase (GPI) if there is one. I have an employee who is departing their current AcqDemo organization on 1 September and moving to another AcqDemo organization. Will they be able to participate in either the losing or the gaining organizations pay pool? The employee will participate in the gaining pay pool. The employee could complete the self-assessment in time for the losing supervisor to enter annual appraisal comments and recommended scores. The gaining supervisor can then leave it as is or make adjustments based on local policy/personal observations. Q: Does the employee who left the organziation do a closeout self-assessment while in the old organization and then an annual self-assessment in the new organization? The employee doing a closeout self-assessment while in the old organization and then an annual self-assessment in the new organization is the correct protocol for departures prior to 1 September, but when an employee leaves in September, it is best for the losing organization to do the annual and it will follow the employee to the new organization and new supervisor. Q: If an organization wants to move a person from one control point to another, do they have to do an internal recruit action, which is internal to the organization and not through CPAC? Movement of an employee from one control point to another within the same BBL requires competition. This competition does not need to be done through USAJOS, it can be internal to the organization (i.e. local canvas). Q: (FOLLOW UP TO QUESTION 15): Does that include the need to clear PPP’s? A one-day PPP clear still needs to be done. Q: When setting pay for promotions from outside AcqDemo, can you confirm pay can be set between 0-20% of the employee’s current basic pay? When setting pay for promotions outside AcqDemo, pay can be set between 0-20% of the employee’s current basic pay. Q: Can an employee be reassigned non-competitively from an NK-03 to an NH-02? Chapter 5, 5.9.1 says going from an NK-03 to an NH-02 is a competitive movement because the salary potential is greater at the NH-02 level compared to the NK-03 level. Nature of this action is 702 promotion or 703 promotion NTE. Q: How do I modify a contribution plan that has been approved? Only the supervisor can modify a contribution plan once it has been approved. The supervisor (or a pay pool administrator acting on his/her behalf via Session Maintenance) goes into the Contribution Planning Module from the Supervisor Menu, clicks on the employee’s name, scrolls to the bottom, and clicks ‘Modify.’ The Contribution Plan is now open for edits/additions/revisions. Q: If an employee will receive a PAQL of “1,” what should (or what is expected) that the numerical score be for that category (-1, -2, -3)? A PAQL of “1” would most likely correlate to an OCS score below the Expected Range. For example, if the range was 64 – 71, a 63 or below qualifies for a PAQL of 1. A score anywhere within the range says the employee is appropriately compensated and successfully met his/her objectives. A -1, -2, -3, etc. says there were problems – work products were late or incorrect, employee needed more guidance or supervision – but it still represents success. A delta OCS of -3 or -2 could qualify for a PAQL of “1,” but there would need to be a significant documentation that addresses poor performance. Q: If an employee receives a -1 or -2 as a category numerical score, then shouldn’t the PAQL score be a “1”? The categorical numerical scores address compensation. Whether or not the employee is appropriately compensated. A -1 or -2 says the employee is over-compensated compared to his/her contribution. There are circumstances that could justify someone being over-compensated, but still performing adequately, i.e. personal or medication issues. Q: Can we assign a score below the ECR based on the idea that the supervisor is not setting the proper example as a leader? Q: I have an employee who will be retiring on/about 2 January 2019 and wants to know the effect of their retirement date on their payout. Will those who were on the rolls at the end of the AcqDemo rating period (30 Sept) get their one-time bonus pay in January regardless of whether they retired before the actual payout or not? Per Army AcqDemo rules, everyone in the pay pool on 30 Sept gets their payout. Someone who is retired on the effective day of the payout will receive Cri and CA as a lump sum in their retirement check. He/she should make sure their pay pool administrator knows so that the spreadsheet that we use can be coded correctly. This needs to be done NLT the beginning of December. Q: In the case above, would their allotted pay increase be paid as a bonus in addition to their bonus pay? Any salary increase (CRI) earned is also paid as a lump sum. Q: Will allocation for bonus pay increase by about 1% over the usual pot of money during the first year in AcqDemo? Funding for first year organization for CRI (salary increase) is 2.4% of base salaries of everyone in the pay pool on Sept 30. Some employees will get the 2.4% in return, some will get less, and some will get more. Funding for first year organizations for CRI (salary increase) is no less than 1.3% of base salaries plus locality of everyone in the pay pool on Sept 30. The last 2 years OPM approved award funding at 1.5%. Q: I have an employee who was out on extended Sick Leave from Dec 18, 2017 – April 11, 2018. Is a midpoint required to be completed for the Oct 1, 2017 – Mar 31, 2018 timeframe even though she was in the office for less than 3 month? The employee can receive a mid-point at the natural half-way mark, i.e. ~Early July. Q: I have 3 new employees who came in Mar 19, 2018. Do they receive midpoints? If so, when should it be performed? These 3 employees can receive a mid-point at the natural half-way mark, i.e. ~end of June. the only time requirement for employees in AcqDemo is to be on board by July 3rd. Even employees who join on July 2nd can receive a mid-point at their natural half-way mark, i.e. mid-August. Q: Do we need to update the supervisor structure and salary prior to our conversion or after? The contractor will build employee records about 2 weeks after conversion based on the most recent DCPDS pull. ACC HQ will then be able to go into CAS2Net and update the fields for salary and the supervisory structure. Q: I will be working for the new organization less than 90 days, what would you recommend for close-out? AcqDemo closeout are different than TPAES closeouts. AcqDemo closeouts are used for transitions – when an employee moves from one AcqDemo org to another, or when there is a change in supervisor. AcqDemo does not require employees to be under a new supervisor for 90-days before they can be evaluated. Since you are going from an AcqDemo organization to another AcqDemo organization, your supervisor on Sep 30 will write your annual assessment. Q: Do I need to get a closeout evaluation prior to departure from the current organization? Your supervisor on Sept 30 can include your losing supervisor’s narrative in the annual appraisal. Q: Will the score transfer to my new organization from the current organization? Only annual appraisals are scored. There is no scoring associated with a closeout appraisal. Q: My assumption is that the DoD AcqDemo OpGuide is still applicable to DCMA. Do you agree? The DoD AcqDemo OpGuide is applicable to the DCMA AcqDemo employees. The DCMA business rules provide additional guidance to what is provided in the OpGuide. This particular section is the same as the AcqDemo Federal Register Notice dated November 7, 2017. Q: Are GS employees who are on pay retention still eligible for pay retention when moving to AcqDemo? GS employees on pay retention who are moving to AcqDemo are still eligible for pay retention. AcqDemo did not waive 5 CFR 536.308. Q: How does 17 Jan 2017 DoD Policy and Procedures for Reductions in Force in the Civilian Workforce adversely impact SSC graduates who do not get a rating of record the year they begin school? No impact. (1) Rating of Record. An employee’s rating of record is the average of the ratings of record drawn from the two most recent performance appraisals received by the employee within the four-year period preceding the “cut-off date” established for the RIF, except when the rating of record in the employee’s most recent performance appraisal is “unacceptable.” When the most recent rating of record is “unacceptable,” only that rating of record will be considered for purposes of RIF. Q: What happens if a PPP match is made? The same thing that happens when a PPP match is made on a GS position. One caveat though, Per AG1CP, I the local canvassing or local announcement stays within the organization there is no need to clear the PPP. A solicitation does require PPP clear. Q: If an employee moves from an NK-02 position to an NH-02, are they eligible for an increase in salary? This move is considered a promotion because the NK-02 pay band has a max salary of $46,906 and the NH-02 has a max salary of $68,983. Any move that has a greater salary potential qualifies for a pay increase. Q: Is there a requirement in CCAS to have a Supervisor Level 2? No, no requirement to have a Supervisor 2. Q: Is there a reference that says only need “one day” as supervisor to rate the employee? The reference is the AcqDemo Federal Register – by omission. The federal Register specifically states that employees need to be in AcqDemo for the 90 days immediately preceding 3 Sept in order to be rated. There is no discussion in the Federal Register of a time requirement for supervisors. Q: Can the SAE approve a CCAS and a Non CCAS award or are these references one in the same? CCAS and Non-CCAS awards are different. CCAS awards apply towards the CA cap. Non-CCAS awards (typically group awards and suggestion/invention awards) do not. Q: If a NH-04 non-supervisory takes a NH-04 Supervisory position, can their pay be increased to 15/01 if the person is below that? No, it cannot. Per 5.3.2.1, Basic pay adjustments within a broadband level is made only with the AcqDemo CCAS Contribution Rating Increase (CRI). Q: How are the Supervisor and Team Lead differentials funded? The funding does not come from the Cash Award that is left over, so all organizations will need to use a different funding source. Q: Will an employee who retires 30 September still receive a pay out from the pay pool? Retirement takes effect at 11:59 PM on the day of retirement, so the retiree is still in the pay pool and receives the payout. You will need to change the coding in Column W of the CMS spreadsheet from a ‘1’ to a ‘2’ for the CRI to roll over to CA. Q: What is the max Cash Award percentage we can use for the 2018 rating cycle? Q: Can the beta 1 for CRI be set at the upper rail? Yes, it should be. Army uses the upper rail for both CRI and CA. Q: In the CMS Spreadsheet, do we have to set aside award dollars for this action? If the PEO needs funding to pay for the extra time-off, you should not redistribute the unused CA throughout the pay pool. Q: How does CAS2Net capture a temporary promotion if it was done prior to 1 October? The employee receives an assessment for work accomplished in his or her permanent position of record during the assessment cycle along with any GPI, CRI, and CA payout. The GPI and CRI remains on the permanent position of record and is the basis for pay setting at the conclusion of the temporary promotion. The new permanent basic pay is compared to the temporary basic pay augmented by GPI, and the larger becomes the employee’s new temporary position basic pay. The computer CA is paid to the employee, but carry-over award is not; unless the permanent position pay is at the top of the broadband level or at or greater than the control point/pay of the permanent position. The DCPODS transactions are sent to the region that services the temporary promotion pay pool. Q: Is it ok to move two NH-04 employees who retired on 29 Sep and 30 Sep to the transfer pool after end dating their record and providing the loss reason code? An employee who retired on 29 Sept – yes. He/She was not a member of the pay pool on 30 Sept. An employee who retired on 30 Sept – no. These employees are entitled to their payout. Do not end date or provide a loss code. Leave them in the pay pool and change column Y in the CMS spreadsheet from a ‘1’ to a ‘2’. Q: Are physicians able to participate in AcqDemo? Q: Can employees grieve the PAQL scores? Q: Do we have to wait to begin the CIP until after the employee(s) receive the rating? It is recommended to give the employee the results of the CCAS and then initiate the CIP. This fives the employee notices of the reasons why they are being placed on a CIP. Q: What percent CRI do first year participants receive? The bargaining unit members will get 2.4% their first year provided they are in a separate pay pool. Non-bargaining follow Organization rules. Q: If the locality code isn’t changed, does the system just automatically correct his locality pay since he’s already at his new duty station? best if you change the locality code too. Q: Are there instructions on how and when to process the TOA in lieu of CA? Q: Will there be a note on the Part 1 that explains the TOA in lieu of CA? If not, would there be an option to add a remark to the Part 1? Notes that show on the Part 1s are added to the CMS Spreadsheet/Data tab/Column AD (Part 1 Remarks). You can add the remarks to your spreadsheet, re-upload into CAS2Net and recertify. Q: For Supervisor Differentials, are there instructions on how to process these actions? See chapter 3 of the 31 August Army Supplement to the DoD Operating Guide. Q: For employee that are on retained pay and do not have a base pay, what amount should be used for their base pay (Step 10, $136,659)? Base Pay for those on retained pay if their entire pay (the combination of base pay + locality), i.e. $167,259.